I got home from Quilt Canada yesterday. My Van is not yet fully unpacked. I drove down last week and was a speaker in the Pre conferance on the Monday and Tuesday. On Monday afternoon I did my talk about my long arm quilting business and then had to rush off to unload my van for the Merchants Mall. It all went well but there was hardly time to breath. Tuesday I spook again but this time it was about being an artist. We had four of us speaking and not alot of time each. As many of the other ladies had said some of the same things I was going to talk about, I decided to touch on getting out of a artist funk. Tuesday afternoon, I spend my time setting up my booth. My mom and friend Deb were great help as they finished putting price tags on my fabric. Above is a basket of snow dyed fabric, it is one of four baskets I took with me. I had many other things to sell as well. 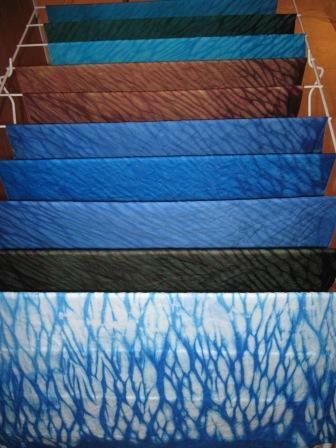 This is a photo of some of the pole wrapped fabric I dyed for my booth. So the booth went well. We always had people in our booth. Some of the other merchants were asking why we were always busy. We did have a very brightly coloured booth with lots to see. I guess we did OK. I had one day I did not sell very much. Not sure why. The others days were better. 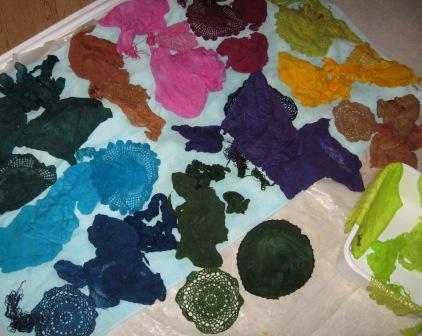 Here is a photo of dollies, napkins, thread, cheese cloth and other cotton bits, I dyed for a fiber kit. 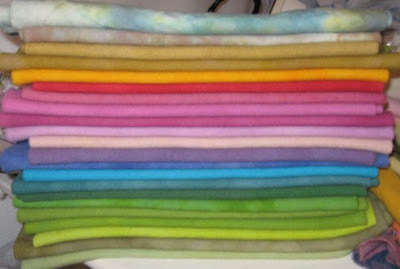 Here is some wool I dyed for the booth. 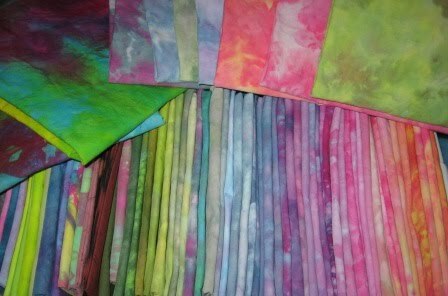 I use Fast Acid dyes for the wool. I did not take a photo of the booth but a friend did. I hope to post the photo later. I took many photos of some of the art quilts but these are for personal use only and I am not able to post the photos. At the National Juried show we were not allowed to take any photos but we could buy the catalog which is great and I got my copy. The art quilts were all great. There was so much to see. It was hard to get away from the booth so that I could see the quilts. It was great to hear your presentations at the Professional Development Sessions and to shop at your booth in the Mall. The time you spent preparing for Quilt Canada showed in with the variety and amount of fabrics and fibres in your booth display. It was difficult NOT to buy buy buy at your booth as the fabrics and threads there were so very "yummy". Every time I went there were folks shopping!! I did come home with some very nice looking silk/bamboo rovings to use. It was nice to chat with you at Quilt Canada.